The basics of music editing! Listen a lot! Until you know the music very well. Find parts of each piece of music that might work for the different movements. Arrange those parts in an order that both maintains the musicality and takes your horse's strengths into consideration. This edit should sound rough! Don't waste your time perfecting it. Use the rough cut to play with choreography ideas. Organize your ideas into a pattern making sure to use a 20x60 meter arena. Keep the music in mind when creating your pattern. Ride the final pattern and videotape your choreography to use in your final editing of the music. Reorder the rough cut if necessary but make sure to keep the musicality in mind! Smooth out the transitions in the rough cut using fading, cutting, overlapping, and other necessary techniques. Check your progress periodically by playing your video along with your music to make sure the timing matches up. The examples given will be done in Apple's editing program GarageBand. GarageBand can be purchased as part of the iLife package from the app store. 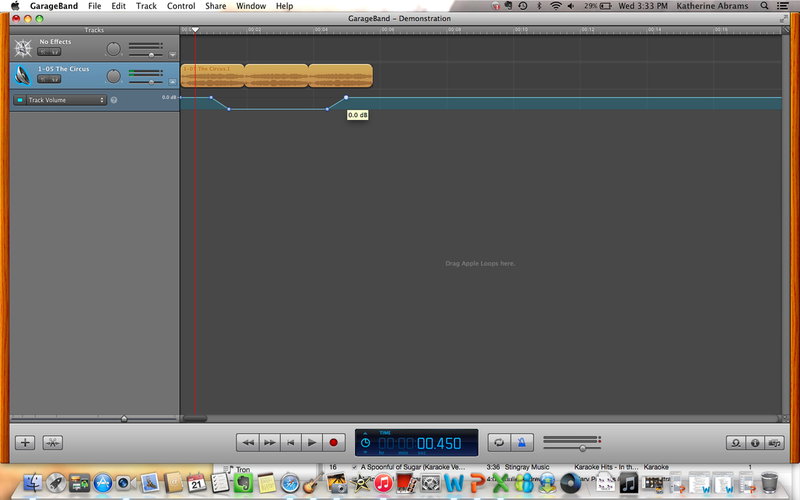 Please Note: This is by no means a complete tutorial of how to use GarageBand. This program has a ton of options for creating amazing sounding edits, compositions, and pieces of music for many different purposes. The purpose of this document is simply to introduce the reader to a few basic skills needed to compile the sort of composition needed for dressage freestyles. It may be necessary to learn other skills in addition to what is noted here so check out the Apple help and also other online resources to continue your education. The skills covered can also be applied to other music editing programs such as Audacity and software available for purchase. When in doubt check out online tutorials to learn about any skill you don't understand. YouTube is a good source for this! Begin by opening a new project in GarageBand. To import music to GarageBand simply drag and drop the file from iTunes or the Finder. GarageBand will automatically create a new track with your music file in it. To find the location you would like to cut the music, listen to your selection while looking at the sound waves. You may zoom in and out using the slider in the lower left of the window in order to get a more detailed view. When you hear the spot you would like to make a cut, take note of what the sound waves look like at that location in order to place the red marker. 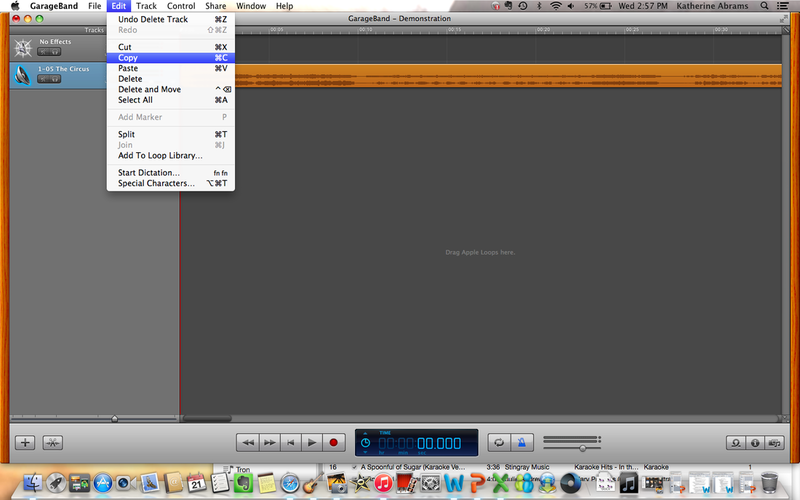 Begin by importing a music file into GarageBand. Select the track you want to split by clicking once on it. Click Command "T" or select Split from the Edit menu. Select the piece of music you would like to copy by clicking once on it. 4. Place the red marker at the location you would like the selection pasted into within the selected track. 5. Press Command "V" or select Command from the Edit menu. Note: You can always adjust the placement of your selection. Simply click and hold the mouse down anywhere on the selection and drag it left and right within the track or up and down to move it to s different track. Also be sure not to paste your music overtop of another piece of music or else it will delete the selection that was originally in the track! I do not frequently use the looping option in GarageBand because you need to be very precise about the beginning and end of your music selection. This can however be a very useful tool for certain edits and works better for some people than others so don't hesitate to give it a try! Edit the beginning and end of the music selection you would like to loop. You can do this by placing your cursor in the bottom left corner at the beginning of the selection or the bottom right corner of the end of the selection. 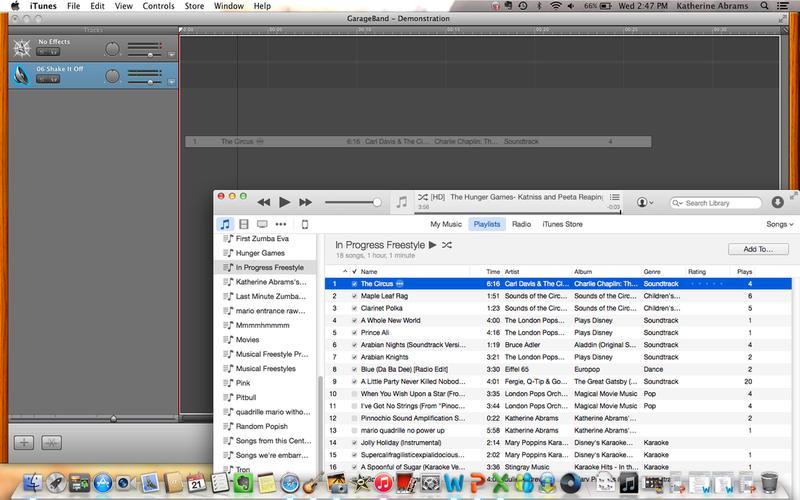 When the cursor changes simply click and hold, dragging the music left or right to lengthen or shorten the selection. Fine tune your editing by zooming in using the slider in the bottom left of the window. Look at the sound waves and make sure you have begun and ended your piece at the exact location you would like so it sounds very smooth at the start and finish. 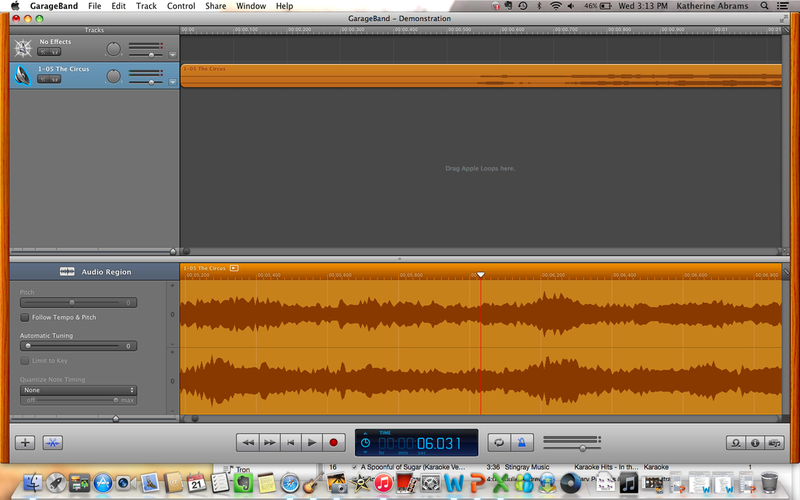 You can also open the precision editor by double clicking on any track to look at the sound waves even more closely. 3. Once the selection is completely edited place your cursor at the top right corner of the region. music from start to finish, as many times as you wish. 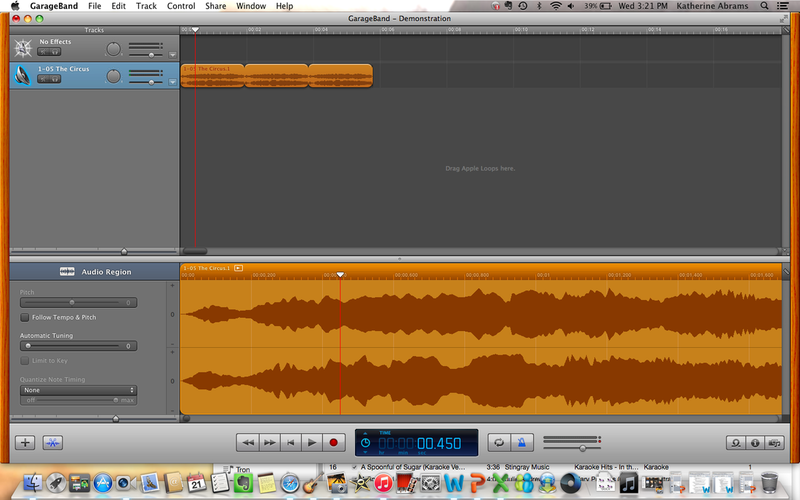 Adjusting the volume of one or more tracks is often necessary when editing music together. You can adjust the master volume of the entire track, or you can add volume automation points to fade in and out and adjust the volume of just a small portion of a track. Open the volume editor of a track. Do this by looking at the track list on the left and finding the track you wish to edit. Within the control box for that track you can click on the small downward facing arrow in the bottom right corner. This will drop down the volume editor. 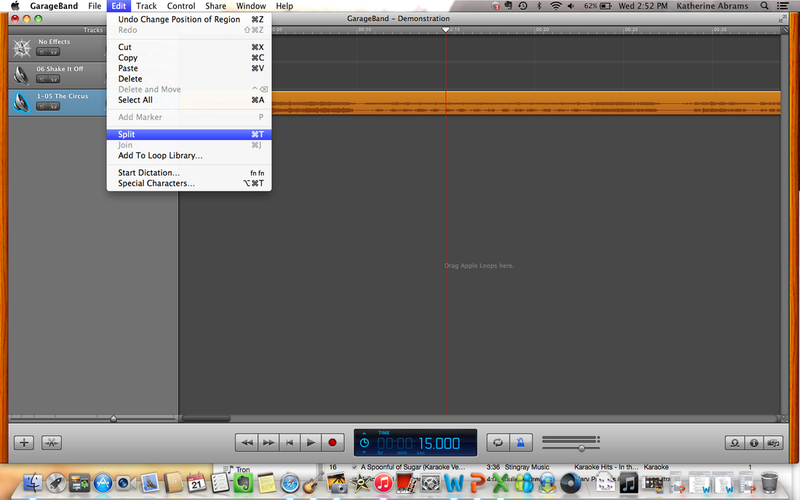 If you would like to edit the master volume of the entire track, use the slider next to the drop down editor. To edit the volume of a specific point in the track click on the blue volume like once to create a Volume Automation Point. 4. Place a second Volume Automation Point to fade in or out. Drag this point up or down to fade louder or softer. 5. You may also make a track quieter and then louder or vice versa for any period of time. Use four Volume Automation Points to do this. With just these few editing skills you should be well on your way to creating your own professional sounding freestyle music! Remember don't plan to spend some time developing your editing skills and also embrace your creativity! Don't worry if your freestyle looks complicated when it is finished. Many edits are often required for a polished freestyle but with work the final audio will be smooth no mater the number of cuts!